Richard Linklater’s Boyhood charts Mason’s (Ellar Coltrane) journey to adulthood. This tale of adolescence was shot over 13 years meaning that all of the characters visually age as the film progresses. Boyhood was thirteen years in the making. It’s an interesting character piece with a focus on the temporal – something that Richard Linklater is known for (The Before Trilogy). But in Boyhood Linklater has done something special. He’s taken a character study, grand in principal, and given us an intimate tale of a boy becoming a man. There are arguments to be had for the legacy of a film about a white middle class entitled child growing up in contemporary America. There are suggestions that perhaps Linklater could have picked a more illuminating character to grow up with. But that negates the simplicity of Boyhood, the sweet story inherent in Mason’s life and struggles. It’s not really about the contextual world that Mason lives within. Instead it’s a time lapse with dialogue, a movie that’s as detailed as it is hands off. In Ellar Coltrane Linklater found an actor that could breathe life into an alter ego that aged as he did. The most successful aspect of Boyhood is something that is found in other movies made by Richard Linklater – the characters. Over the course of the film we get to know them all and by the end of the film we don’t want to leave them. This must have been the feeling that Linklater and the cast were left with too; a sadness that the story is over, or perhaps more aptly, a sadness because we’ll never see Mason live out his life as an adult. The narrative follows Mason from the age of five until he turns eighteen. We get to see him survive primary school, attempt individuality in high school, and eventually journey with him to college. This is an epic film in scope as eighteen years of life unfold during its runtime but the focus is on Mason and his life. The form never takes precedent and although this does lead to some uneasily plotted moments, the overarching whole is sublime. There’s something indefinable about time and our existence within it. Richard Linklater keeps that mystery at arms length and instead we’re left with little in the way of an explanation. Everyone finds their own meanings in life and the beauty of Boyhood is that we watch Mason attempt to do just that. It’s not just Ellar Coltrane that does well with the material provided though. His older sister Samantha (played by Linklater’s daughter, Lorelei Linklater) convincingly conveys the complexities of siblinghood. But it’s Patricia Arquette that stands out as Mason’s mum. She’s divorced, a single mum, and not the best at picking relationships but her life is equally prescient. She struggles to care for her children but she does her absolute best. Her sad twist is the fact that she seems to be attracted to violent and abusive partners, a pattern that she doesn’t seem likely to break. Ethan Hawke plays the estranged father of Mason and Samantha and he’s charming, charismatic, and seems much more fun than their mother. Hawke conveys the loneliness of a father removed from his children, his life still not that of a grown up, but again he’s someone that’s just trying to live his life. That’s the point really. We all struggle but ideally we all do our best. The hardest truth of Boyhood is the fact that Mason is a child for most of the run time, in fact we leave him when he reaches adulthood, and the world that a child sees is never fair. It’s not something that they can control or influence. The way that Boyhood comes across to audiences seems to be determined by the specific individuals watching it. For parents Boyhood will be a touching account of kids growing up, for young adults it’s more likely to be nostalgic and reflective of their recent experiences, but for most it will be a bittersweet story about one child reaching adulthood. In this we find both Mason’s story and the story that everyone experiences. In many ways Boyhood is hard to define. Yes it’s a character piece, a coming of age tale, but it’s also much more than that. It’s an innovative approach to cinema, it attempts to capture time and its effects rather than simply represent them. And in those grand schemes it succeeds but what it does best is in the juxtapositions, the conflicts, and the differing perspectives between the old and the young. 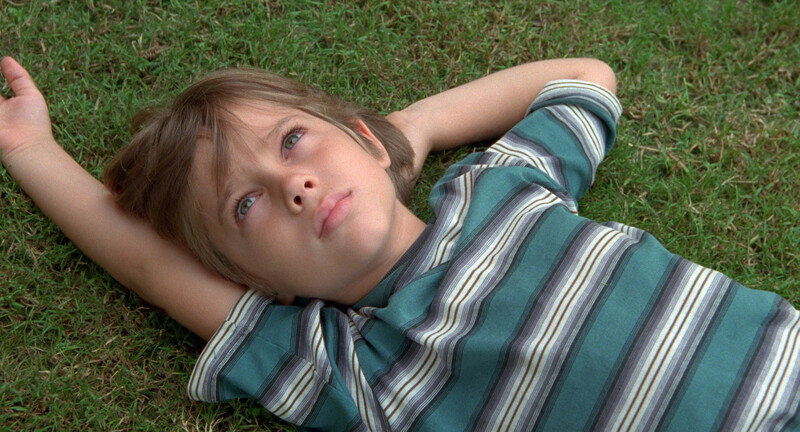 For every character in Boyhood time is both an illusion and a very real threat. Everyone knows in theory that time is short and that we only get one chance to live our lives. But that doesn’t stop them (or us) from making bad decisions. Childhood for Mason disappears as quickly as it occurs but for audiences his journey to adulthood will stand with them for some time. It would be fitting perhaps to revisit Mason later on, perhaps see him in middle age, but something would be lost. The mystery would be replaced by realism; the poetry of Boyhood would be marred by the realities of growing old. The unspoken fear inherent in Boyhood (and simply in life) is the fact that we all will die eventually. But until we do there are experiences to be had, excitement to be found, and art to be made. And that’s what Richard Linklater and the cast of Boyhood have done so well. Collectively they have crafted a film that can be read as art, a film that reiterates to us the frailty of the human condition but also the beauty. Ethan Hawke’s father figure gives Mason a gift at his birthday. It’s a family heirloom, a memento, something that speaks more about Mason’s father than about Mason himself. The Beatles Black Album, an album compiled by Mason’s father of all the great songs made by individual Beatles after the band broke up. This is a gift that could only exist with the passing of time, a product of pop culture, and a product of the past. Everything is fleeting and nothing lasts forever. Luckily for us, much like Mason’s father did with the Black Album, Linklater has compiled and organised a life on the cusp of adulthood. Everything we see belongs to the past but the gaze is always towards the future. Mason leaves us when he reaches eighteen but the effects of Boyhood linger long after the credits roll. I wanted to give you something for your birthday that money couldn’t buy, something that only a father could give a son, like a family heirloom. This is the best I could do. Apologies in advance. I present to you: THE BEATLES’ BLACK ALBUM. Liner notes from the Black Album – listen to it here.